Studied law and economics (1964-1972). Worked in the Vienna Chamber of Labour (1972-1986); employed in the economics department (finance and environmental policy). Director of the newly-founded Department for municipal, economic, health and housing policy (1976-1986). Chairman of the SPÖ Committee on Local Government (1995). 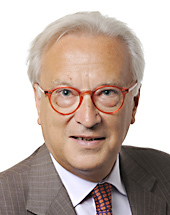 SPÖ Federal Chairman responsible for education; member of the SPÖ Federal Executive; Member of the Vienna SPÖ Executive; Chairman of the Meidling district SPÖ (since 1979). Member of the Vienna Assembly and Municipal Council (1983-1986). Socialist Group coordinator in the Vienna Assembly and Municipal Council (1986-1988). Municipal councillor responsible for urban development, planning and staff (1988). Municipal councillor responsible for urban development, planning and transport (1988). Municipal councillor responsible for urban development, planning and external relations of the city of Vienna (1988). Member of the European Parliament since 1996. Vice-Chairman, PSE Group, European Parliament. PSE Group parliamentary manager. Vice-President, Interparliamentary delegation for relations with South-East Europe (1997-2004). (30) Since gas supplies from third countries are central to the security of gas supply of the Community, the Commission should include an 'energy security clause' in trade, association, and partnership and cooperation agreements with producer and transit countries. This 'energy security clause' should stipulate measures to prevent supply crises or to help to overcome those supply crises which are not the responsibility of the parties concerned. The Commission shall coordinate the actions with regard to third countries, working with producer and transit countries on arrangements to handle crisis situations and to ensure a stable gas flow to the Community. The Commission should be entitled to deploy a task force to monitor gas flows in crisis situations within and, in consultation with the third countries involved, outside the Community and, where a crisis arises due to difficulties in a third country, to assume a mediation and facilitation role through the Vice- President of the Commission/High Representative of the Union for Foreign Affairs and Security Policy. Article 3a Long-term security of supply measures At the latest one year after the entry into force of this Regulation, the Commission shall present a report containing proposed regulatory measures that could be implemented in order to diversify, at Community level, the geographical sources of gas and the routes of supply into the EU. The report shall include, in particular, an assessment of the role of LNG installations. An overview of the gas storage capacities of the different Member States should also be given. (18) It is important that gas supply is maintained, particularly as regards household customers, as well as other protected customers such as schools and hospitalsa limited amount of additional customers, especially customers delivering important public services, which can be defined by the Member States concerned, in cases in which the market cannot continue to supply them. It is essential that the measures to be taken during a crisis are defined in advance of any crisis. (30) Since gas supplies from third countries are central to the security of gas supply of the Community, the CommissionUnion, in the event of a Union Emergency the Commission, after consultation of the Gas Coordination Group, should coordinate the actions with regard to third countries, working with producer and transit countries on arrangements to handle crisis situations and to ensure a stable gas flow to the CommunityUnion. The Commission, after consultation of the Gas Coordination Group, should be entitled to deploy a task force to monitor gas flows in crisis situations within and, in consultation with the third countries involved, outside the CommunityUnion and, where a crisis arises due to difficulties in a third country, to assume a mediation and facilitation role. (1) "protected customers" means all household customers already connected to a gas distribution network, and, if. Member States concerned so, may decide, can als to include small and medium-sized enterprises, schools and hospitals provided that they are already connected to gas distribution network;a limited amount of additional customers especially customers delivering important public services; but in any case, these extensions must not interfere with the principles of European or regional solidarity towards countries with supply problems. Article 3a Long-term security of supply measures At the latest one year after the entry into force of this Regulation, the Commission shall present a report containing proposed regulatory measures that could be implemented in order to diversify, at Union level, the geographical sources of gas and the routes of supply into the EU. The report should include proposals to the different Member States concerning activities and measures in order to enhance security of gas supply. The report shall, in particular, include an assessment of the role of LNG installations. An overview of storage capacities for gas for and in different Member States shall be added. In addition, the report shall make proposals for stronger regional cooperation in setting up regional preventive action and emergency plans. Any regional cooperation for the purpose of the implementation of this Regulation shall be conducted by the Competent Authorities of the Member States, involving the natural gas undertakings, the regulatory authorities and the industrial consumers and in close cooperation with the Commission. This regional cooperation shall support and must not interfere with the general European solidarity obligations. Where the regulatory authority is not the Competent Authority, the regulatory authority shall be formally involved in the processes of establishing the Preventive Action Plan and the Emergency Plan. The Competent Authority shall take utmost account of the assessments made by the regulatory authority insofar as they refer to network-related regulatory issues in particular concerning the development of the impact assessment regarding the fulfilment of infrastructure standards according to Article 6 with regards to future approval of tariffs and the consistency with network development plans. 1. By [31 March 20146; 3five years after entry into force] at the latest, the Competent Authority shall ensure that in the event of a disruption of the largest gas supply infrastructure, the remaining infrastructure (N-1) has the capacity to deliver the necessary volume of gas to satisfy total gas demand of the calculated area during a period of sixty days of exceptionally high gas demand during the coldest period statistically occurring every twenty years. Three years after entry into force, the most important investments should be in place and a report of these investments should be given by the Competent Authorities to the Commission. (4a) Where new cross border interconnections are needed or existing ones need to be extended, close cooperation of the Member States concerned, Competent Authorities and, where they are not the Competent Authorities, the regulatory authorities shall take place at an early stage. 5. The transmission system operators shall enable permanent physical capacity to transport gas in both directions on allthose interconnections within twohree years from the entry into force of this Regulation, except in cases where at the request of a Competent Authority, the Commission decides that the addition of a bi-directional flow capacity would not enhance the security of supply of any Member State. Such decision may be reviewed if circumstances chang especially concerning pipelines, connecting production sources, LNG facilities, or interconnection points with distribution networks or where gas quality constraints render bi-directional flows impossible. The level of the bi- directional flow capacity shall be reached in a cost efficient way and at least take into account the capacity required to meet the supply standard set in Article 7. Within that two year period, the gas transmission system operator shall adapt the functioning of the transmission system as a whole so as to enable bi-directional gas flowsThe Competent Authorities and the Commission shall ensure that the assessment of the interconnections is regularly reviewed if circumstances change, in particular through the updating of the national and the Union Preventive Action Plan. 7. National Regulatory Authorities shall take into account the costs of fulfilling the N-1 standard and the costs of enabling the permanent physical capacity to transport gas in both directions in their approval of tariffs in line with Article 41(8) of Directive […/…2009/73/EC]. In the case of costs incurred in more than one Member State, the national regulatory authorities of all Member States concerned shall jointly decide on cost allocation. Article 8(1) of Regulation (EC) No …/… shall apply before any investment decision is taken. The same applies if costs incurred in one Member State contribute to the enhancement of security of supply in one or more other Member States. Any such investment decision shall be subject to approval of its costs and their allocation by all of the national regulatory authorities concerned. The proportion to which each Member State benefits from the infrastructure investments with regard to security of supply shall be taken into consideration. 3a. The Emergency Plan shall also identify the necessary measures and actions to be taken in case of an Emergency to mitigate the impact of a gas supply disruption on the supply of electricity and district heat to protected customers. 1. The Commission, after the consulting the Gas Coordination Group, may declare a CommunityUnion Emergency at the request of one Competent Authority or when the CommunityUnion loses more than 10% of its daily gas import from third countries as calculated by ENTSO-G. It shall declare a CommunityUnion Emergency where more than one Competent Authority has declared Emergency following the verification in accordance with Article 9(6). It may declare a CommunityUnion Emergency for specifically affected geographical regions comprising more than one Member State. 1 a. Notes that the main effects on the national budgets result from the lower economic growth and lower return from taxes and higher expenditures to combat unemployment. 67 a. Notes that rising international competition on the international labour market in combination with technological innovation put more and more pressure on the European labour force and contributes to rising inequalities and therefore Europe must undertake more efforts to correct the rising gap between rich and poor. 154a. Considers it necessary, that all possibilities of the present treaty must be used to make progress towards an coordinated efficient economic, financial and monetary governance. The President of the Commission, the President of the Council and the President of the Euro group together with the relevant Commissioners must form the core group of that governance. They must be in close cooperation with the finance ministers of the Eurogroup, the President of the ECB and all the finance ministers of the EU, There must in addition be a close dialogue with the European Parliament, which must be fully respected as a co-legislator and as a directly elected body representing the European peoples. (1a) The aim of a strong economic coordination must be the establishment of a stable economic and social union based on the principles of the community procedure. (12a) In this respect the European Commission and European Council should respect the role of the Social Partners, especially the right of collective bargaining, and may invite them to help promote appropriate actions to mitigate imbalances. 2a. In the framework of the corrective action plan the Social Partners may be invited to take appropriate actions. In any case the right of collective bargaining must be respected. (2) It ensures that Member States provide for appropriate national arrangements for athe highest level of safety based on the current state of science, in spent fuel and radioactive waste management to protect workers and the general public against the dangers arising from ionizing radiation. (3a) It is not allowed to export radioactive waste outside the European Union. (fa) shall include a calculation of all the costs generated by spent fuel and radioactive waste management. The information must comprise the institutions bearing the costs. (3a) The national competent regulatory authorities shall regularly exchange their experiences and coordinate their policies with a coordination role of the European Commission. Member States shall ensure that appropriate quality assurance programmes are established and implemented on the basis of the current state of scientific knowledge concerning the safety of spent fuel and radioactive waste management are established and implemented. (1) Member States shall ensure that information on the management of spent fuel and radioactive waste from all sites is made available to workers and the general public. This obligation includes ensuring that the competent regulatory authority informs the public in the fields of its competence. Information shall be made available to the public in accordance with national legislation and international obligations, provided that this does not jeopardise other interests recognised in national legislation or international obligations such as, inter alia, security. (1a) Member States shall ensure that all decisions concerning sites for, and management of, spent fuel and radioactive waste close to neighbouring countries shall involve the public and the institutions of the countries concerned. (1) Member States shall submit a report to the Commission on the implementation of this Directive for the first time by ….., and every three years thereafter, taking advantage of the review and reporting cycles under the Joint Convention on the Safety of Spent Fuel Management and on the Safety of Radioactive Waste Management. (3) Member States shall periodically, and at least every 10five years, arrange for self- assessments of their national framework, competent regulatory authority, national programme and its implementation, and invite international peer review of their national framework, authority and/or programme with the aim of ensuring that high standards are achieved in the management of spent fuel and radioactive waste. The outcomes of any peer review shall be reported to the Commission and the Member States. (1) It is important to ensure that consumers can have confidence in the integrity of electricity and gas markets and that prices set on wholesale energy markets reflect a fair interplay between supply and demand and no undue profits can be drawn from market abuse. (7) Derivative trading and commodity trading are used together on wholesale energy markets. It is therefore important that the definitions of market abuse, which consists of insider trading and market manipulation, are compatible between derivatives and commodity markets. Therefore this Regulation should in principle apply to all transactions concluded. (11) Specification of the definitions of inside information and market manipulation is necessary to account for the specificities of wholesale energy markets, which are dynamic and subject to change. TOn the basis of clear definitions set out in this Regulation, the Commission should be empowered to adopt delegated acts in accordance with Article 290 of the Treaty in respect to such detailed rulethe detailed rules. Whenever the Commission is willing to adopt delegated acts, it is of particular importance, that the Commission carry out appropriate consultations during its preparatory work, including the Agency, energy market operators, national regulatory authorities and the European Securities and Markets Authority (ESMA). The Commission, when preparing and drawing up delegated acts, should ensure a simultaneous, timely and appropriate transmission of relevant documents to the European Parliament and Council and ensure that the European Parliament and the Council are closely involved in the preparatory phase, notably by being invited to take part at the expert meetings. (11a) Energy trading firms covered by this Regulation which do not fall within the scope of Directive 2004/39/EC should be subject to EU-wide authorisation requirements. This Regulation should provide for a tailor-made authorisation scheme for energy traders, for scrutinising market participants' capacity to respect this Regulation while avoiding the application of the burdensome requirements for financial traders included in Directive 2004/39/EC. In order to provide for a tailor-made authorisation scheme for energy traders, the power to adopt acts in accordance with Article 290 of the Treaty on the Functioning of the European Union should be delegated to the Commission in respect of the requirements and scope for authorisation, the procedures for granting and refusing authorisation as well as the conditions for withdrawal. (14) Efficient market monitoring requires regular access to records of transactions. For this reason market participants who trade wholesale energy products should be required to provide this information to the Agency. If necessary for an efficient monitoring, the Agency may establish liaison points close to significant trading venues. (19) National regulatory authorities should be responsible for ensuring that this Regulation is enforced in the Member States. To this end they should have the necessary investigatory powers to allow them to carry out this task efficientlyhe Commission should together with the Agency care for a coordinated and consistent way of applying the monitoring and investigating powers. This regulation shall apply to all participants in the markets concerned irrespective of whether they are from the Union or from third countries. It shall apply to all sales, purchases, production, supply, transportation and delivery of wholesale energy products. 8a. ‘Agency’ means the Agency for the Cooperation of Energy Regulators established by Regulation (EC) No 713/2009. 4. Market participants shall publicly and effectively in a timely manner disclose inside information in respect of business or facilities which the participant concerned owns or controls or for which the participant is responsible for operational matters, either in whole or in part. Such information shall include information relevant to the capacity of facilities for production, storage, consumption or transmission of electricity or natural gas. A ‘de minimis’ threshold shall be established to exempt from the reporting requirements operators which, by virtue of their size, are unlikely to influence the energy markets. The Agency shall be provided with the financial and human resources necessary for it to adequately fulfil the additional tasks assigned to it under this Regulation. If necessary, it may establish liaison points close to significant trading venues. The Member States shall lay down the rules on penalties applicable to infringements of the provisions of this Regulation and shall take all measures necessary to ensure that they are implemented. The penalties provided for must be effective, proportionate and dissuasive. They shall reflect the gravity of the infringements and shall considerably exceed the real or potential gains from illegal operations. In close cooperation with the Agency and the Commission, the Member States should agree on minimum standards for penalties and coordinate their sanction system. The Member States shall notify those provisions to the Commission by ... at the latest and shall notify it without delay of any subsequent amendment affecting them. 1a. Whenever the Commission is willing to adopt delegated acts, it is of particular importance, that the Commission carry out appropriate consultations during its preparatory work, including the Agency, energy market operators, national regulatory authorities and ESMA. The Commission, when preparing and drawing up delegated acts, shall ensure a simultaneous, timely and appropriate transmission of relevant documents to the European Parliament and Council and ensure that the European Parliament and the Council are closely involved in the preparatory phase, notably by being invited to take part at the expert meetings. Article 17a Agency staffing and resources By 31 December 2011 at the latest, the Agency shall assess the staffing and resources needs arising from the assumption of its powers and duties in accordance with this Regulation and submit a report to the European Parliament, the Council and the Commission. 8. Recognises the importancCalls therefore ofn the BSC, the BSEC, as well as the role played by the Black Sea Synergy, and calls on the CommissionCommission to make the Black Sea region a more urgent priority and to develop an EU Black Sea Strategy accompanied by an Action Plan with flagship projects in the following cooperation areas: sustainable economic development, improving the connectivity and communication, environmental protection, security, migration with the widest possible involvement of all relevant operators and regional partners, environmental protection, security, migration, support for and development of civil society, and cultural exchange and education by using all available financial instruments (CF, ERDF, NIF, NPI). (41 a) Member States should help CHP undertakings in particular to benefit from support measures. This Directive establishes a common framework for the promotion of energy efficiency within the Union in order to ensure the achievement of the Union's target of 20% primary energy savings by 2020, with the option of taking into account Early actions by Member States, and to pave the way for further energy efficiency improvements beyond that date. 27 a. Early Action savings are savings resulting from energy efficiency measures by the Member States, initiated no earlier than 1995 and effective until at least 2016. 2a. Member States shall support public bodies in carrying out the comprehensive renovation provided for in Article 4. Member States shall ensure that public bodies purchase only products, services and buildings with high energy efficiency performance at any rate until 2018, and with maximum energy efficiency performance thereafter, as referred to in Annex III. 3. Measures that target short-term savings, as defined in Annex V(1), shall not account for more than 1025% of the amount of energy savings required from each obligated party and shall only be eligible to count towards the obligation laid down in paragraph 1 if combined with measures to which longer- term savings are attributed. c) allow obligated parties to count savings obtained in a given year as if they had instead been obtained in any of the two previous or two following yearsover the whole period. Member States shall promote the availability to all final customers of energy audits which are affordable and carried out in an independent professional manner by qualified or accredited experts. 2. Member States shall ensure that enterprises not included in the second subparagraph of paragraph 1 are subject to an energy audit carried out in an independent professional and cost-effective manner by qualified or accredited experts at the latest by 30 June 2014 and every three years from the date of the previous energy audit. 3. Energy audits carried out in an independent professional manner resulting from energy management systems or implemented under voluntary agreements concluded between organisations of stakeholders and an appointed body and supervised by the Member State concerned or by the Commission, shall be considered as fulfilling the requirements of paragraph 2. Member States shall adopt authorisation or equivalent permitting criteria to ensure that industrial installations with a total thermal input exceeding 20 MW generating waste heat that are built or substantially refurbished after [the entry into force of this Directive] capture and make use of their waste heat. The provisions of Article 10(8) shall not apply to installations which, on energy- efficiency grounds, use their own waste heat in the production process. 5a. Member States may give priority to high-efficiency large units in urban areas. 7. Member States may allow producers of electricity from high-efficiency cogeneration wishing to be connected to the grid to issue a call for tender for the connection work. The technical and safety standards set by network operators should be included when doing so. (b) At least every two months for the consumption of natural gas. Where gas is used for individual heating, billinginformation shall be provided on a monthly basis. (c) With centralised heating and cooling, billinginformation shall be provided on a monthly basis during the heating/cooling season, where this is technically feasible and appropriate. (d) At least every two months for hot water billing, where technically feasible and appropriate. 27. Deplores, however, the fact that none of the conditions set by the European Parliament in February 2008 in order to move ahead with the Interim Agreement have been fulfilled, in particular free and unfettered access for the International Committee of the Red Cross, the release of all political prisoners and prisoners of conscience, the abolition of all government impediments to travel, and the possibility for NGOs to operate in the country; considers that these conditions must be met in order for Turkmenistan to comply with the international standards it has ratified.